Yesterday, the health & fitness world lost a true icon whose been cracking the whip since the 1930's. 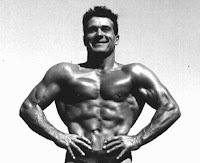 Jack LaLanne's life on this earth expired at the young age of 96 due to complications from pneumonia. Known in the fitness world as the "Godfather of Fitness", Jack performed multiple feats of strength and endurance. His first such stunt was an underwater swim the length of the Golden Gate Bridge, loaded with 140 pounds of equipment, in 1954. He went on to stage many attention-getting events, including completing over a thousand pushups in a little over 20 minutes, and towing 65 boats filled with thousands of pounds of wood pulp in Japan. To honor Jack LaLanne and all he stood for to promote optimal health & wellness for all men, women & children, here's a link to a video that I posted back in April of last year - A Blast from the Past - Jack LaLanne. Here's to you Jack and thank you immensely for all you have done to pave the way for all of us who follow in your footsteps.